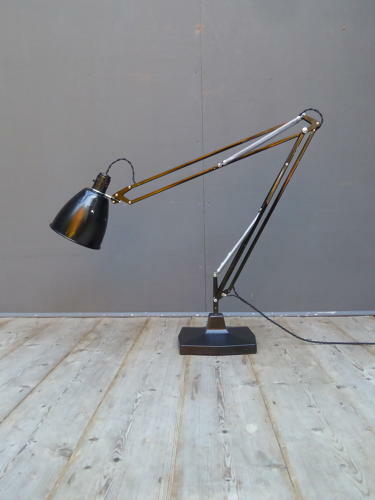 A fantastic example of a large vintage Anglepoise 1209 lamp by Herbert Terry & Sons. An iconic design classic featuring a heavy cast iron base, original black paintwork with contrasting chrome springs & fittings & a tulip shade. The base is finished in its original 'crinkle' paint, the shade retains its original switched Bakelite bulb holder & the lamp has been rewired in twisted black flex. Wear commensurate with age as pictured, very good example overall. Height measurement above refers to the lamp in the classic position.